Renewable energy has moved beyond the experimental phase. Economies of scale have reduced the investment costs to the so-called “grid parity” level, the level at which the renewable electricity is cheaper than the standard power from the grid. Due to this, massive investments are flowing to renewables. In 2017, 61% of all power production capacity that was added in the world was renewable. And the investment costs continue to decline. Interestingly, we’ve recently also seen a sharp decline in the cost of batteries. These could become a key infrastructure to deal with the problems of intermittent wind and solar power production. On-site PPA’s. A project developer installs e.g. solar panels on your rooftop, feeds the electricity into your installation and you pay a certain price for that electricity. In this case, you are not using the public grid to transport the electricity. Off-site PPA’s. You buy electricity from a renewable energy production away from your facilities and you use the public grid to transport the electricity. Whether on-site and/or off-site PPA’s are interesting or not depends on factors such as regulations in a country, cost level, resource availability, etc. In general, on-site PPA’s will generate large savings (dollar or EUR per MWh) but for small volumes. Off-site PPA’s will generate smaller savings but for larger volumes, so that they have a bigger impact. With markets that have risen to historical highs in many countries recently, fix price off-site PPA’s have been smartly marketed as opportunities to generate savings. However, many of those have a high risk of turning into a nightmare when markets start to fall. Therefore, before entering into PPA negotiations, it’s important to get well acquainted with the ins and outs of these instruments and set up an energy transition plan. Where is the delivery point of the PPA? If this is the exit point, the connection of your consuming facility to the grid, it means that the seller of the PPA will take care of transporting the electricity over the transport grid. That creates issues in terms of having two suppliers on one connection point. Therefore, most off-site PPA’s specify delivery on the entry point, the connection of the producing site to the grid. This means that you will either have to integrate those PPA’s into your physical supply contracts (sleeving) or settle them financially by selling the PPA electricity at the entry point and buying it back simultaneously at your exit point. In most PPA’s, the energy is delivered as a profile, e.g. of a windmill. That production profile will not coincide with your consumption profile, meaning that you will continuously have to buy extra or sell back from and to the spot market. In many countries, low wind also means high prices and high wind low prices, meaning that this balancing of the production and consumption profiles over the market can cause high costs. An alternative is to buy the PPA power as a capacity block, but in that case, the higher risk assumed by the supplier will probably result in a higher risk premium included in the PPA pricing. That balancing energy and the residue energy, the amount of energy that you buy structurally from the grid, can be included or not in the PPA arrangement. Be careful when they are included as you might lose opportunities to sign better contracts elsewhere. Some “all-inclusive” PPA’s are not much more than a barely hidden attempt at locking in clients for the long term. A lot of PPA’s come as fix price offers. Alternatives are spot indexation with a discount. Such market-based pricing is often limited to the downside with floor prices or on both sides with so-called collar prices. Single-country or cross-border PPA’s. In case of a financial settlement, you can buy electricity in one country (or a location in the US), sell it in that country’s or that location’s spot market and buy it back in your local spot market. In an extreme case, you might consider buying all your energy needs through one cross-border PPA. However, setting up such a structure might have unwanted consequences for your accounting. Moreover, it creates a risk on the spread of prices between the two countries. 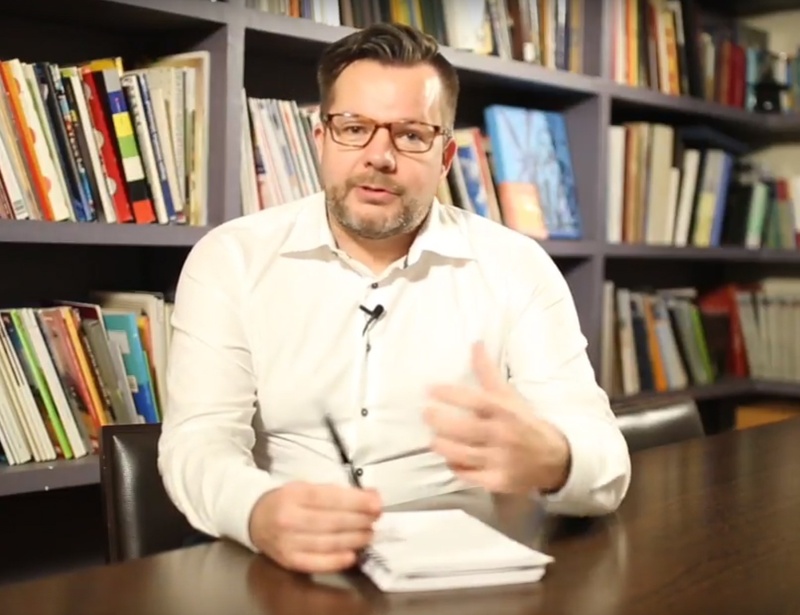 Making the right analysis of a PPA proposal’s typology is important for making the right decisions. Which type fits your needs best, depends on your energy transition plan. The energy transition will change the way we buy energy forever. We are moving from having one natural gas and one electricity contract to a much more complicated set of contracts: combinations of on- and off-site PPA’s, contracts for residue and balancing energy, battery storage contracts, demand side management contracts, third party agreements for hedging, etc. Moreover, these contracts can come in complicated combinations of serving different sites. This is not futurology; all these new types of energy proposals are already on the table in more and more countries. Therefore, an energy buyer cannot ignore the energy transition and needs to work out a plan. In a first step, to define a plan, a company should make its renewable energy target more concrete. With stakeholder analysis and an assessment of “the factory of the future” and what attitude you want to adopt to all these new technologies, you can finetune your general “X% of renewable energy by this year” target to much more concrete targets of what you want to achieve by buying Guarantees of Origin or other paper green energy products and with PPA’s. You can also determine what role you see for the different technologies and whether you want to be an early adopter or not. In the second step, you can align your renewable energy plans with your overall energy price risk profile. A budget risk client wants to stabilize energy costs over the long term. Prudent, step-by-step buying of long-term fix price PPA’s can service those needs. 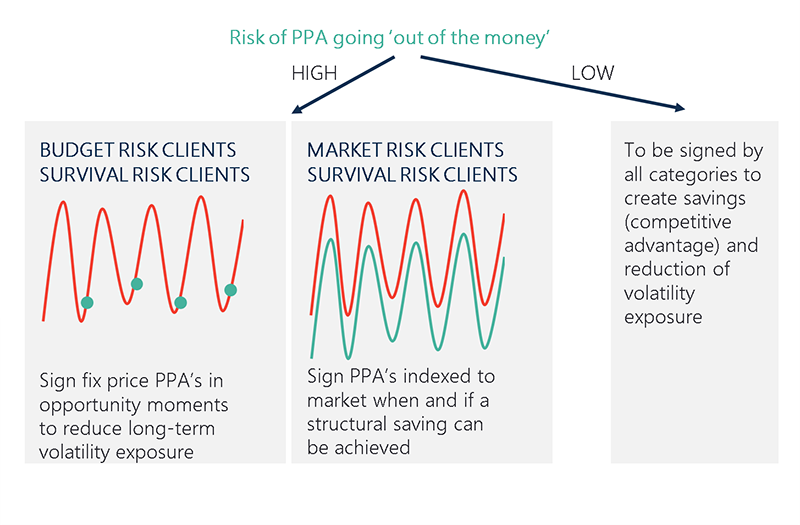 Market risk clients need to avoid ending up with a fix price PPA in a bearish market, paying more than what they or their competitors would pay if they bought energy from the grid. For them, spot prices with discount might be a better choice. A good analysis of your risk profile helps you to determine what pricing formulas fit you best. In a third step, you should align with your financial department on what instruments are acceptable to them. PPA’s with financial settlement and cross-border PPA’s will generate different cost and revenue lines, in some cases even on the balance sheets of different legal entities. By discussing this upfront, you avoid the frustration of seeing the deals you negotiated falter in a late stage because the price management structures they include are not acceptable to your company. In a fourth phase, you can go and assess the potential you have in all the different sites in the different countries in terms of on-site and off-site PPA’s with technology scans and market scans. Executing this energy transition plan will not work if you don’t put in place the right decision-making processes. Therefore, your plan should also include tables with responsibilities and workflows for the decision-making. Based on all this analysis you can edit a detailed energy transition plan that gives everyone in your organization concrete guidance for realizing the corporate renewable energy goals. Benedict is one of the founders of E&C Consultants. He collaborated with many companies in energy procurement in the past twelve years at E&C. Benedict has a broad experience regarding the energy markets in many different countries.